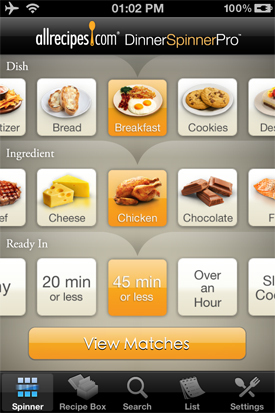 Use the AllRecipes app to spin meals or save your favorite recipes. 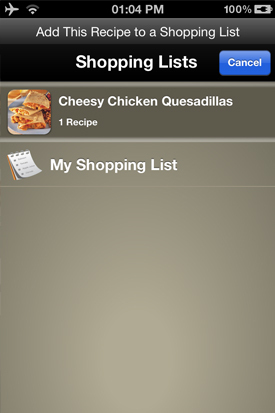 AllRecipes is a shopping list, recipe storage and meal planning app with a few unique twists. Though many of the features are the same as other apps, there are a couple features that really make this app stand out. First of all, you get full access to AllRecipes’ immense database of recipes. AllRecipes is one of the largest recipe websites on the web. 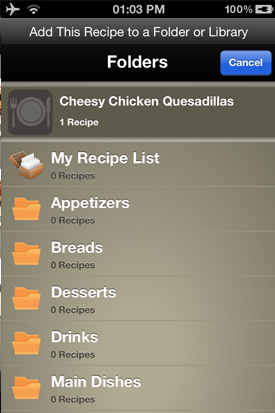 The AllRecipes app ties into this database, allowing you to search all their available recipes from your smartphone. 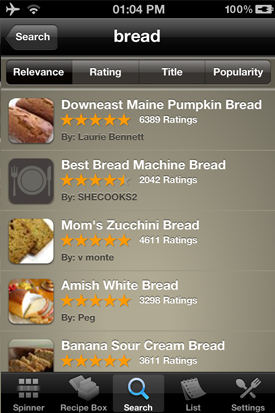 In other words, the breadth of foods you can cook is larger than almost any other app. Second, you have the dinner spinner. 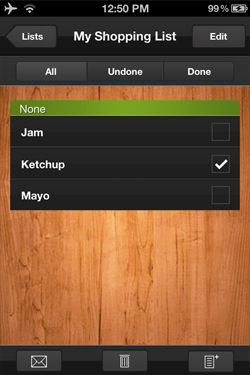 This app makes it easy to choose what kind of meal you want to have. Just choose the kind of food you’re cooking, the meal you’re having and how long you want it to take to prepare. AllRecipes will do the rest. 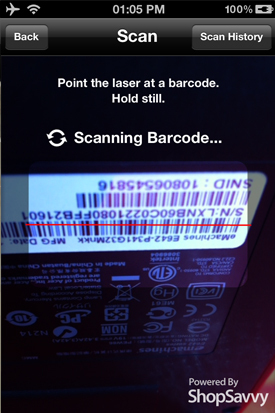 Finally, you have barcode scanning. Though a few other apps do offer the same functionality, it’s still quite a rare feature today. If you like to cook or if grocery shopping is a regular part of your life, this app can help add more flavour to your meals while helping you save time. Here’s how to use the AllRecipes app. The concept is very simple. Along the top, select what kind of meal you’re trying to make. You could choose breakfast, lunch or dinner; or you could choose things like “cookies,” “deserts,” “appetizers” and so on. Basically, select what category of foods you’re looking to make. Next, select the primary ingredient you want to use. For example, if you want to cook chicken for lunch, just scroll over to the chicken button and select that. Finally, choose how long you want the food to cook. This makes it extremely easy to find recipes based on how much time you have to make your food. Once you perform a search, you’ll then be taken to the results page. 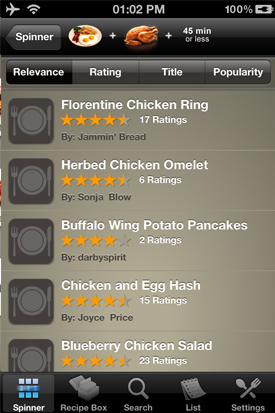 Each page will feature a range of different meals, along with that meal’s ratings. Ratings are all done by members of the AllRecipes community. Generally speaking, higher rated foods are tastier than lower rated foods. You can change how to recipes are sorted by selecting one of the four tabs along the top. Once you select a recipe, you’ll be taken to that recipe’s details screen. There you’ll get to see more details about the recipe, as well as a list of all the ingredients. 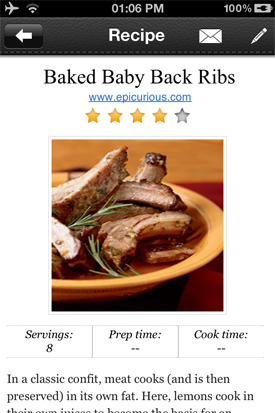 Once you’ve found a recipe that you like, click the button in the upper right corner. This will bring up a screenfull of options for you. 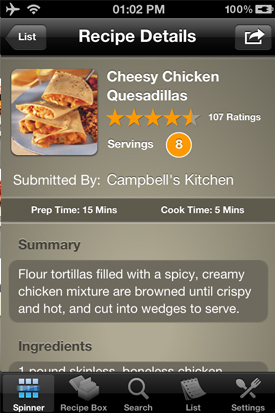 If you should add your recipes to your recipe box, this recipe will then be stored in your online AllRecipes account. 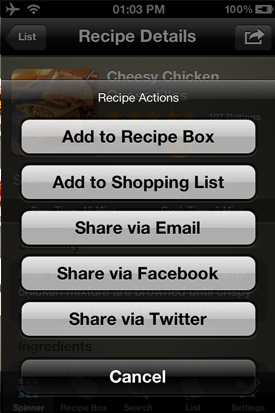 You’ll be able to access this recipe box from any digital device, including your phone and your computer. Think of it as your save folder for recipes. If you add the recipe to your shopping list, the ingredients from this recipe will be conveniently added to your grocery list. This makes shopping for the things you need a whole lot easier. Finally, you have the share buttons. You can share the recipe via email, Facebook or Twitter. If you choose the “Add to Recipe List” option, this is what you’ll see. You can select what category you want to put your recipes in. 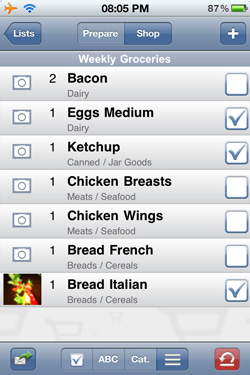 Sorting your recipes by category makes planning meals easier, as you can just view all your recipes in that group. If you add the recipe to your shopping list, this is what you’ll see. Once you’ve added the item to your shopping list, you can click your shopping list to see what’s inside. 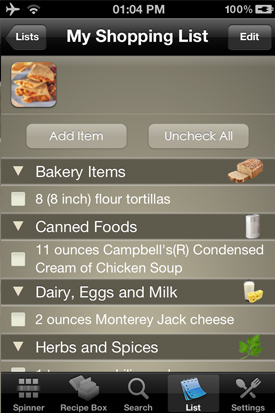 As you can see, all the items needed to cook your selected recipe have been added. 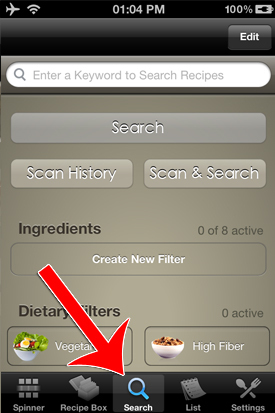 To use the search function to find specific recipes, click the search button in the bottom navigation bar. This is what the search results screen looks like. It works a lot like the dinner spinner. Hold the red line directly in the middle of the barcode to scan an item. 1) Find recipes that have that item. For example, you can scan a can of sardines you found to quickly pull up all the sardine recipes in AllRecipes’ database. 2) Add them to the spinner. For example, you can scan tomatoes to add tomatoes to the spinner. 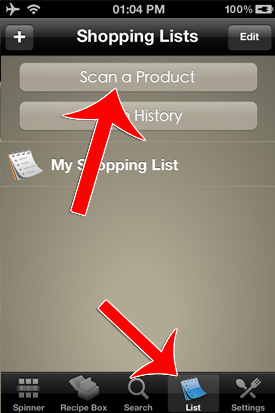 3) Add the scanned item(s) to your shopping list. You now know the AllRecipes app inside and out. You know how to spin for your perfect meal using their spinner. You know how to save the meal to your recipe box and your shopping list. You know how to share your recipes. You know how to turn your shopping list into a grocery list and you know how to use the scanner.